Watching Olbermann Watch: Is Johnny Dollar admitting to being a propagandist and smear merchant? Is Johnny Dollar admitting to being a propagandist and smear merchant? 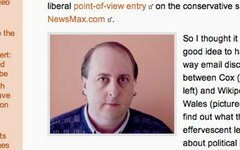 Johnny Dollar on his blog, Johnny Dollar's Place: "Name-calling and personal attacks: the last resort of all propagandists and smear merchants." Johnny Dollar on OlbermannWatch: "the infamous, deplorable Keith Olbermann" ... "Olby cackled his insults and the gullible swallowed them whole. But, as is the case with so many of Keith's assaults on Mr Bill, this too proved to be nothing more than Another Olbermann Lie." If it walks like a duck and it talks like a duck, it must be a propagandist and smear merchant. Remember little Johnny: you said it, not me.